High amplitude is achieved with linear vibration. 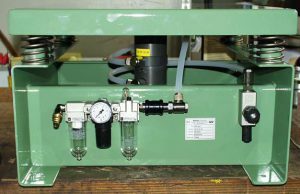 Pneumatic springs were used to offer spring rate adjustment. 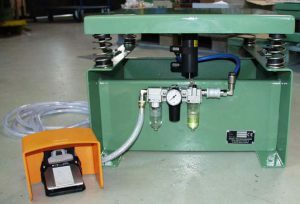 Complete pneumatic control and exhaust throttle mounted on the base frame. The control package is mounted on the base frame. Operation with foot valve. Excellent vibration insulation provided by coil springs. Height 15”.